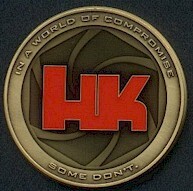 A natural follow-on to the full size USP series is the HK line of USP compacts. The high capacity magazine ban of 1994 was mostly responsible for an entirely new genre of compact handguns built around the arbitrary 10 round capacity imposed on U.S. citizens, while it was in effect. Like its bigger brothers, the USP Compact was first offered in 9mm and .40 S&W, before later being offered in .45 ACP and finally .357 SIG. USP stands for Universal Selbstlade Pistole, or Universal Self-loading pistol in English. (OoneeverSALeh Zelbstladah Pistoleh.) 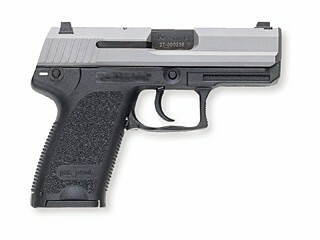 It has been incorrectly labeled in major American gun magazines as the Universal Service Pistol. 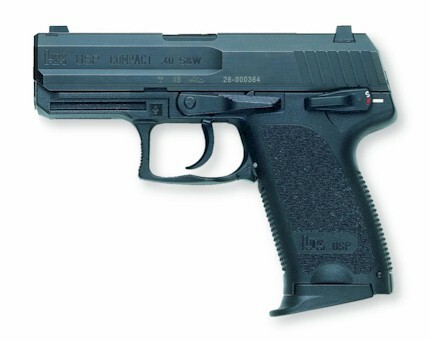 The USP line was designed by the great Helmut Weldle, longtime HK engineer and the brains behind many of HK's great firearms. 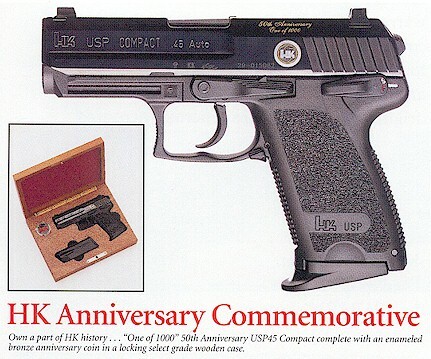 The USP40 Compact, Serial number 364. 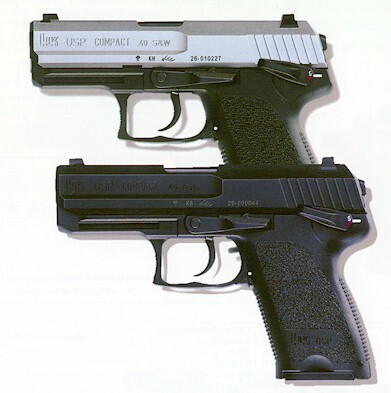 As with the full size guns below, the USP Compact has exactly the same selection of variants. 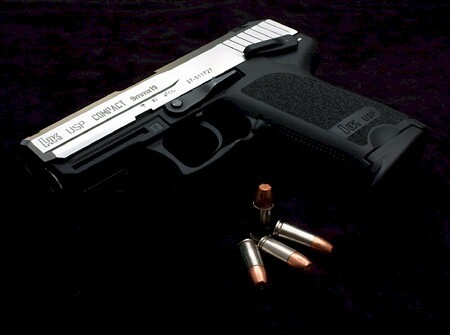 Magazine capacities for the Compacts are 13 for the 9mm, 12 for the .40, eight for the .45 and 12 for the .357 SIG. 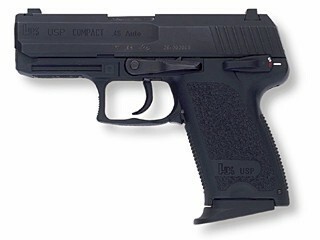 The USP45 Compact. Magazine capacity is eight rounds. 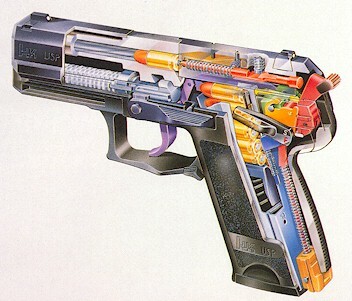 Internal detail of the USP Compact. Note non-bobbed hammer. 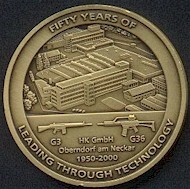 Detail of the commemorative coin included with the limited edition USP45 Compact. 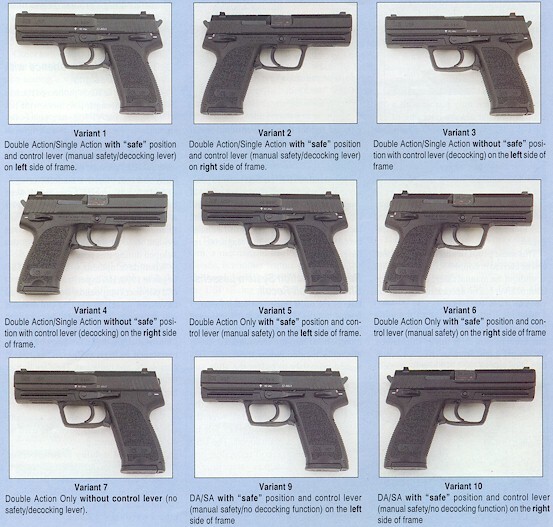 Complete listing of all USP variants as of 1994. These have not changed since the pistol was introduced.